A barber who used a loud hailer to alert drivers about traffic wardens has been silenced by a warning from Cornwall Council. The authority has put Andy Blackwell on a "cautionary list" of people they see as a threat to their workers' health and safety. It came after two wardens confronted him at his Liskeard shop. 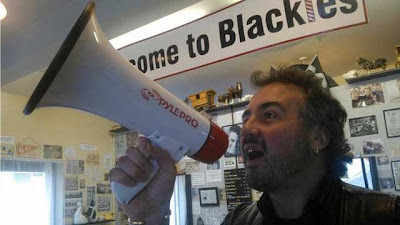 Mr Blackwell, 51, has now hung up his megaphone and has started a petition for free parking in the town. He said: "I decided to warn people that traffic wardens were in the area, so they had a fair chance of moving their cars. It's a little bit of fun, and people have thanked me." With the loud hailer emitting a siren sound he repeatedly called: "Traffic warden alert." After one warning, he said he was confronted by two traffic wardens, one of whom said he was acting "pathetically" and took a photo of him. He said: "I asked them 'How come there's two of you doing your job? Does one do the reading and one do the writing?' I never threatened, or cursed or swore. As far as I was concerned I was doing a public service." But his comments led to a letter from Cornwall Council telling him he had been put on a "cautionary contact" list. The letter said he had "verbally abused" council employees, causing them "extreme distress". Cornwall Council said in a statement: "The cautionary contacts list is an internal system which aims to protect council staff from potentially harmful situations, including physical assault and verbal abuse. Many local authorities around the country have similar schemes in place., This information is only used within the council and is only available to those employees who may potentially be exposed to such risks." It said the list would be reviewed in a year. Mr Blackwell said he did not want to further "antagonise" the council but said customers would be still be allowed to use the loud hailer. "I asked them 'How come there's two of you doing your job? Does one do the reading and one do the writing?"